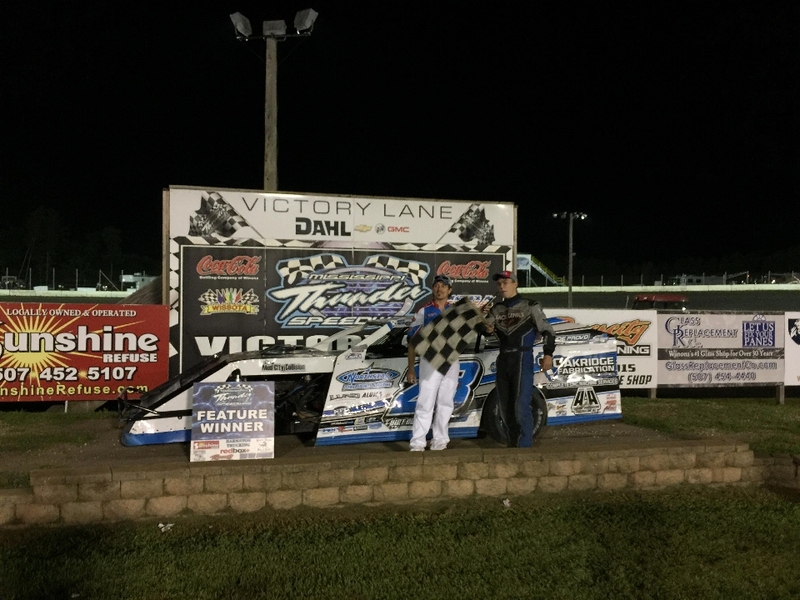 HALE USES LATE-RACE CHARGE TO WIN BAEHMAN LAW B-MOD CHALLENGE AT MISSISSIPPI THUNDER SPEEDWAY! Waits, Provinzino, Krause, & Miller Also Race Their Way Into Victory Lane! 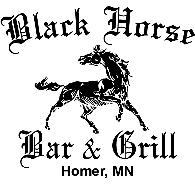 FOUNTAIN CITY, WI (Friday July , 2018) – For the 10th year, MISSISSIPPI THUNDER SPEEDWAY rolled out the red carpet for the Black Horse Bar & Grill USRA B-Mod division compliments of Baehman Law Racing's presentation of the "Baehman Law B-Mod Challenge"; a $1,000-To-Win Mid-Season special that's been bringing the best B-Mod racers to the high-banked black-clay oval for years on end. Under a beautiful clear blue sky, racers and race fans alike were treated to another picture-perfect evening of excitement that should keep them talking until the next special event at the west-central Wisconsin jewel! To look at the starting line-up, one might have been tempted to choose a couple names from the front two rows; former feature winner J.T. Wasmund lined up on the inside of the front row, while third heat race winner Taylor Skauge placed his #32 on the outside of the second row. Sandwiched between the two former feature winners were the #19 of Nicholas Wagner and the #28J of Jackson Hale; both of whom ran to lightning fast second place finishes in their respective heat races. And no one would have over reacted, if you'd passed over a bent up and crumpled B-Mod lined up deep in the field. Sure, the driver has a proven record - sure, the driver had won features before - sure, the driver had collected championships before . . . but, lately, luck hadn't actually been on his side; even rolling over just week's prior, necessitating almost a complete rebuild. But, strapped into the driver's seat of that battered and bruised Black Horse Bar & Grill USRA B-Mod sat a competitor who's learned through the years that to succeed, one must never ever surrender; a driver who's learned, in more ways that one, to wrestle the competition - as well as any hard luck along the way - to the mat and wait for submission. From the inside of the fifth row . . . Parker Hale, was going to need to utilize every ounce of skill he's accumulated through his career if he was going to have any chance at a B-Mod Challenge win. At the drop of the green flag, Wasmund (behind the wheel of a car that had literally been torn down the the bare frame, and rebuilt from the ground up - in a single week) streaked away from the field. What a story-book scenario it would be, if Wasmund's #51W could be the phoenix to rise from the ashes of destruction the prior Saturday to wrangle a $1,000 come-back win out of the hands of his compatriots. Using the opening lap as a launching pad - Wasmund opened up a commanding lead via the entire 30-lap feature's fastest lap! The event's only sub-17 second lap (16.842 - a full 1/4 second faster than the second quickest lap) sprang Wasmund out to a lead that seemed to stretch larger and larger with each successive lap! But, there was speed deep in the field as well - Hale commanded the extreme low groove through the opening 1/2 of the 30-lap feature, slowly but surely making his way through the pack. But, as Hale broke the top-6, Ryan Olson was moving faster, and closer to the front at the extreme high groove at the top of the banking. "I saw Ryan Olson pass me WAY UP at the top of the banking," explained Hale later, "and I could just see how much better he was getting around the track. I followed him up there and knew right away that it was the right decision." 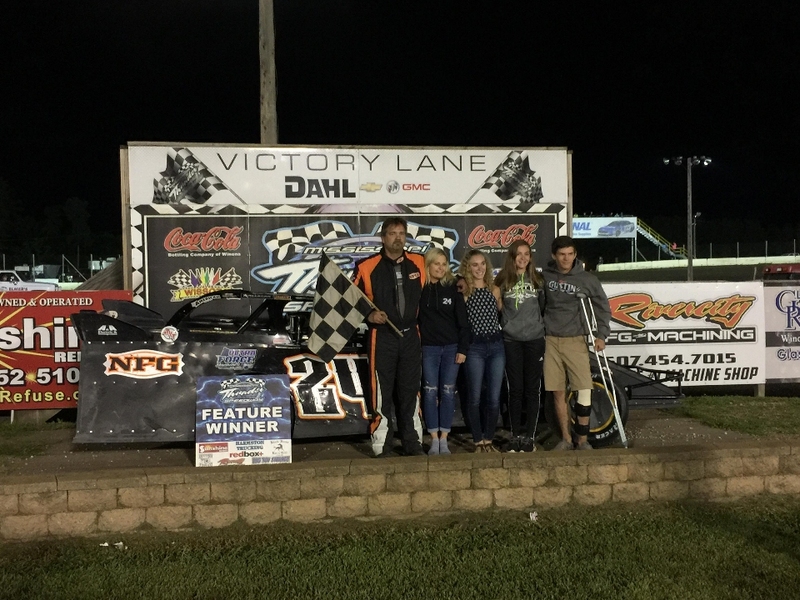 Hale shot to the front of the field and was able to claim the lead as the field closed in on the 20-lap mark; a lead he kept until the checkered flag waived to end the Baehman Law B-Mod Challenge. While the story-book run was still on for Wasmund, he then just a single spot away from the ultimate finish - the Pine Island, MN youngster (who'd also just celebrated his 16th birthday the prior Wednesday) was half to settle for a second-place finish behind Hale. If Hale's run from 9th to 1st wasn't impressive enough - Shaun Walski turned a sour heat race finish into pure gold, running through the field from a 19th place starting spot to cross the line in third, just a second behind Hale as he crossed the line! 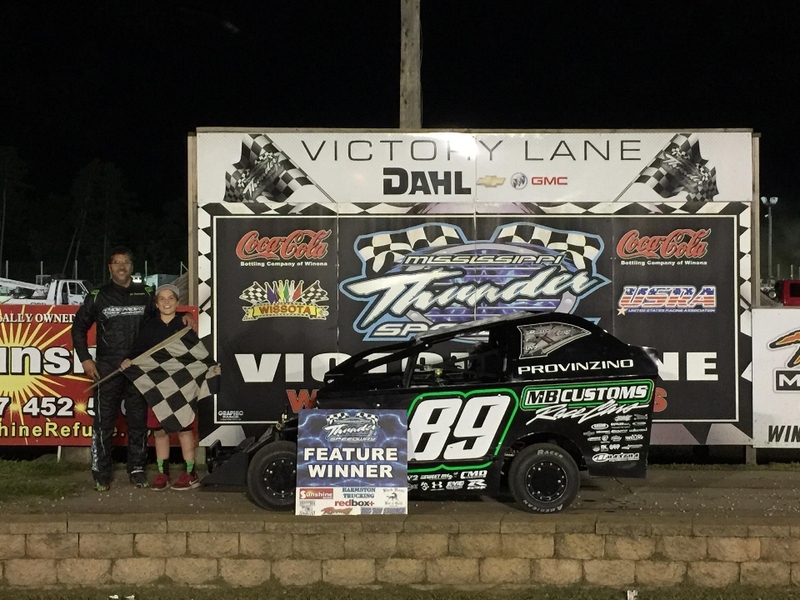 Brad Waits resumed where he'd left off near the end of June - returning to the Dahl Chevrolet, Buick, GMC MTS Victory Lane as a Rivercity Manufacturing USRA Modified feature winner. 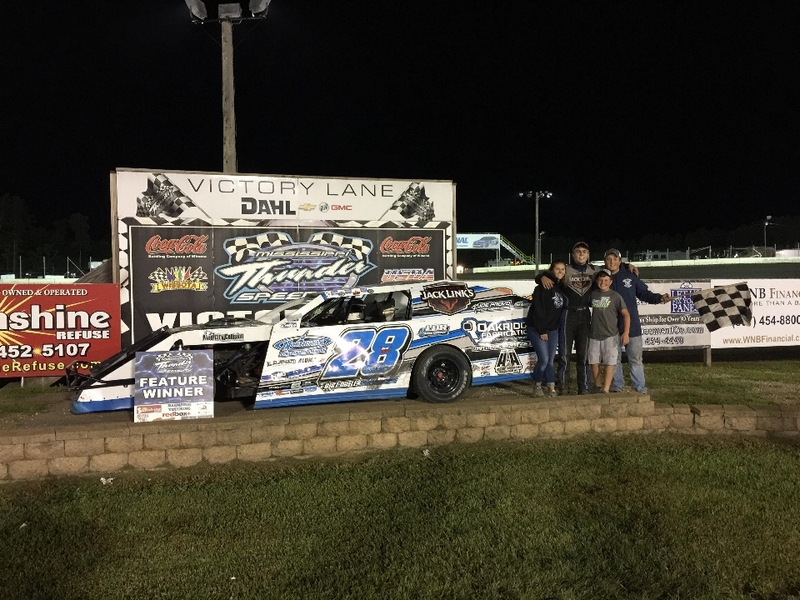 Jumping from his pole-position starting spot, Wait's fended off opening lap challenges from Josh Angst (#99) and Keith Foss (#95) to wheel his NFG #24 to his 3rd feature win this season at MISSISSIPPI THUNDER SPEEDWAY! Angst and Foss followed Waits across the line with second and third place finishes respectively. Early in the year, Joe Provinzino told a friend that as soon as he got to 100 feature wins, his plan was to retire. But, what Provinzino may not have factored into that plan was the fact that winning is addictive and a whole heck of a lot of fun!! After that 100th feature win . . . he strapped back into the car and soon, there was feature win #101. 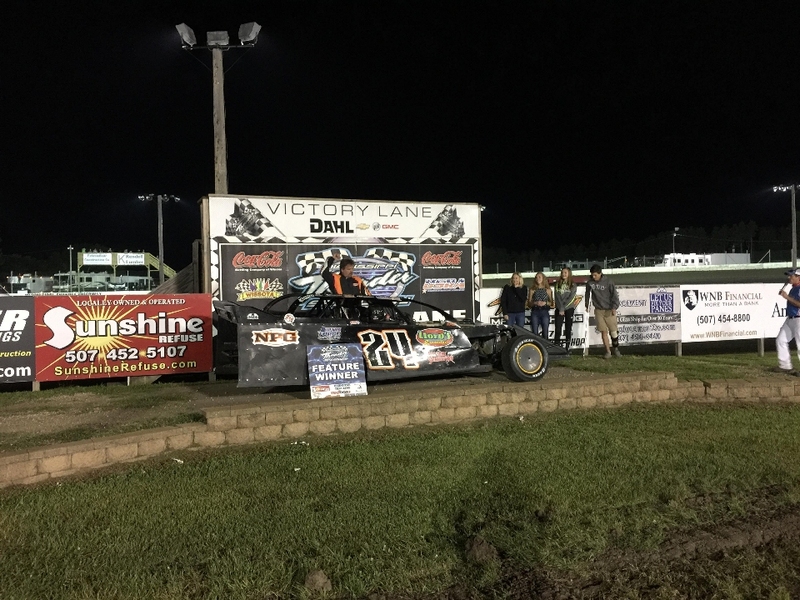 Then, Friday night at MISSISSIPPI THUNDER SPEEDWAY there was, you guessed it, feature win #102. Former Track Champion Greg Wohletz, and multi-feature winner Chris Gilbertson looked fast enough to battle the eventual winner, but such was not to be - Provinzino smiled his way to the checkered flag - with Gilbertson and Wohletz following in second and third respectively. Travis Krause can now add his name to an ever growing list - similar to unbeaten Lance Hofer (in the USRA Late Model division) . . . a list of "Wins-In-A-Row". 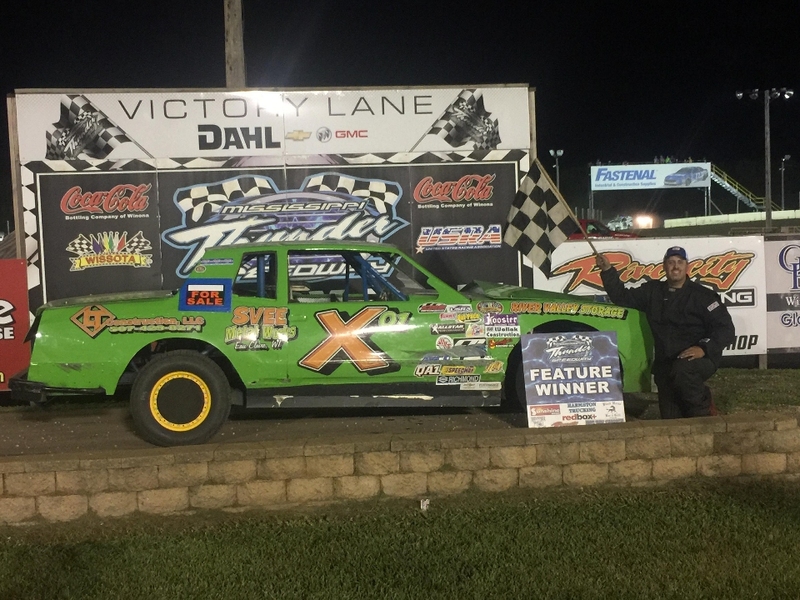 Friday night provided the Buffalo City, WI racer with his third feature win in a row via dominant flag-to-flag run at the front of the Jailhouse Saloon USRA Hobby Stock feature field. Jay Mensink (#19M), Kevin Hager (#94) and Cody Rollinger (#18) battle at the front of the field the entire feature, with Rollinger only falling out of the top-3 late in the 15-lap feature. Mensink and Hager raced to second and third place finishes, while Quinn Arnoldy snuck past Rollinger for fourth. Hunter Miller claimed the Harmston Trucking MTS Hornet feature by fending off advances by heat winners Johnny Severtson and Jason Schloegel, as well as point leader Don Martens - beating them, and the rest of the field, to the checkered flag. Martens finished second, keeping Severtson behind him in third, as Chris Gilbertson and Dan Prissel completed the top-5. 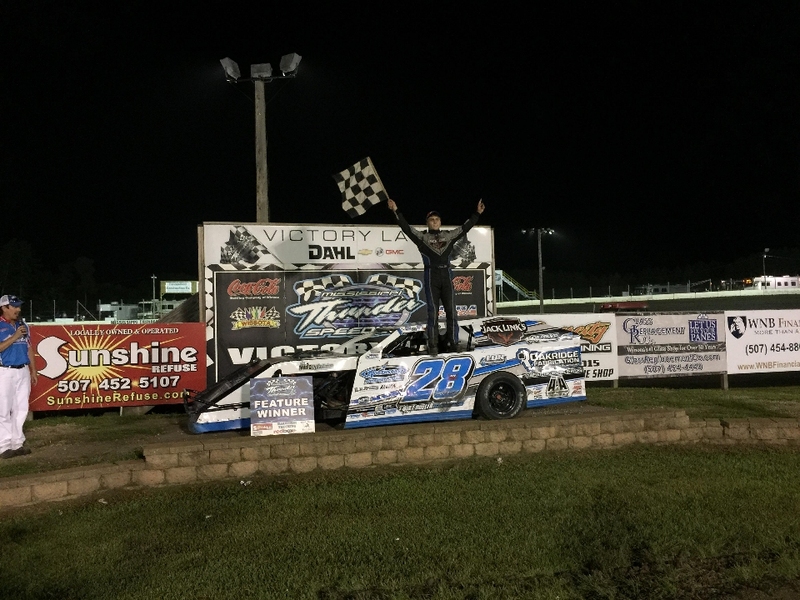 Lilli Reps emerged from behind the wheel of her #29 Sunshine Refuse Sr Slingshot with tears of joy in her eyes and trembles of excitement in her fingers, after claiming her first feature win of the year on The LIGHTNING SPEEDWAY! In the Jr Slingshot division, Mason Stockhausen reclaimed the lead late in the feature win grab another win ahead of Ian Engrav! MISSISSIPPI THUNDER SPEEDWAY will once again roar to life Friday August 3rd with and exciting night of regular season points paying action in all divisions! RESULTS - FRIDAY JULY 27th - "BAEHMAN LAW B-MOD CHALLENGE"